Vittore Crivelli (1444-1502) was the youngest brother of Carlo Crivelli under whom he probably trained. Around 1465, he followed his brother to Zara, Dalmatia where he took on a pupil and by 1481 had moved to the Marches. He settled in Fermo with his brother and spent there most of the rest of his life. This panel painting originally attributed to Carlo Crivelli was later accordingly recognised as by Vittore and part of the altarpiece commissioned in 1481 by the Vinci family in Fermo. The present work, along with 765:1-1865 is one of the four panels that flank the tabernacle in the upper part of the altarpiece. It shows, set against an elaborate gilded background adorned with an intricate pattern of acanthus leaves, griffins and crowns, the half-length figure of St Catherine of Alexandria richly dressed with a crown alluding to her noble birth. She holds a martyr palm in her left hand resting on a wheel, her traditional attribute. She was renowned for her knowledge and wisdom as witnessed by the book she holds in her right hand, which could also represent her credo in the Holy Scriptures. She is looked as a patron of education. Set against a golden tooled background depicting an intricate pattern of acanthus leaves, griffins and crowns, is the half-length figure of St Catherine wearing a lavish embroidered golden dress and a red and green mantle; she holds a palm in her left hand resting on her wheel and a book in the other. Historical significance: The present panel, along with 765:1-1865, was in the Soulages collection, mainly assembled in Italy in the 1830s. The whole collection was then bought by a group of English collectors in 1856 and was subsequently acquired by the Museum in 1865. Originally attributed to Carlo Crivelli, this painting has been accordingly recognised to be by his younger brother Vittore (Crowe and Cavalcaselle, 1871) who formed his style in Carlo's workshop and developed a very close manner. This panel, along with its pendant 765:1-1865, belongs to the upper part of an altarpiece dated 1481 and commissioned by the Vinci family in Fermo where Vittore has settled in the 1480s and spent most of the rest of his life. 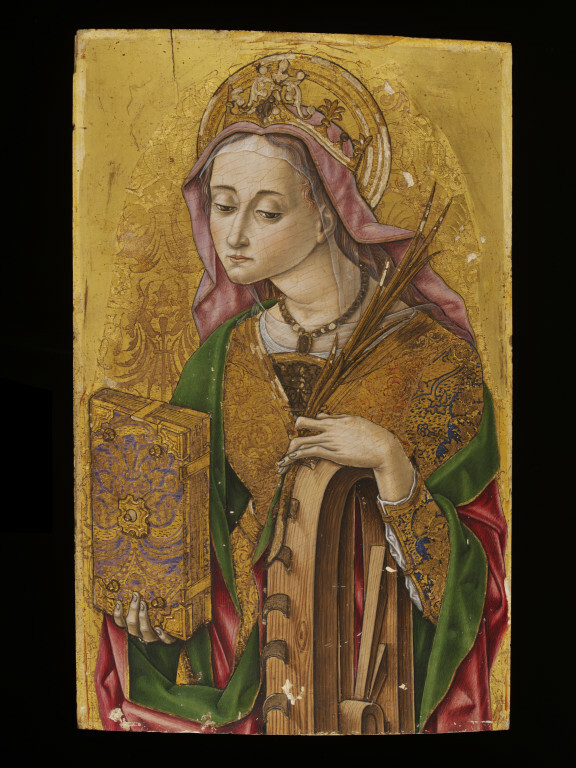 This altarpiece was identified on stylistic ground, especially because of the peculiar tooling on the gilded background representing an intricate pattern of acanthus leaves, griffins and crowns never found again in Vittore's prolific oeuvre. 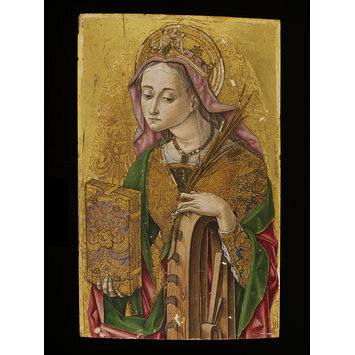 The present work shows the half-length figure of St Catherine of Alexandria who was an early Christian martyr as attested by the palm she holds in her left hand. She was condemned for not renouncing her faith to be martyred on the wheels, which are here depicted under her left hand and became her traditional attribute. But the legend has it that the wheels were broken on God's command leading to her eventual decapitation. She is wearing a lavish embroidered golden dress, a red and green mantle and a crown on a purple veil alluding to her noble birth and was renown for her knowledge and wisdom attested by the book she is presenting in her right hand. The colours of a dress echo somehow the colour of St Jerome's outfit in red and purple (765:1-1865). F. Zeri (1961) suggested that this panel along with St Jerome (765:1-1865), St Anthony of Padua and St Bernardino of Siena (both Van Heek collection, s'Heerenberg) flanked a tabernacle representing the Pietà (Kress collection, University of Arizona Museum of Art, Tucson). This hypothesis was taken over by Sandra di Provvido in her monograph on the painter (1972). The lower part of the altarpiece is formed by five panels from the Wilstach collection in the Philadelphia Museum of Art representing the full-length figures of St Bonaventure and St John the Baptist on the left, St Louis of Toulouse and St Francis on the right, the central panel showing a lavish Madonna and Child enthroned with four angels and cherubs. Vittore Crivelli is considered as a minor artist compare with his elder brother Carlo. His style appears somehow more provincial and lacking of the prolific fantasia that characterises Carlo's output. He borrowed from his brother a certain angularity in drawing the faces and hands, which he accentuated without reaching similar expressive results. Nonetheless, Vittore succeeded in providing most of his compositions with a sweetness and a grace that gave them a character of their own, mostly distinguishable from his brother's hand. The Vinci altarpiece was already considered by his contemporaries as his masterpiece. F. Zeri, in Bollettino d'Arte, 1961, pp. 231, 234. J. C. Robinson, Catalogue of the Soulages Collection,1856, p. 161, no. 580. Crowe and Cavalcaselle, History of painting in North Italy, i, 1871, p. 98, n. 3. Crowe and Cavalcaselle, History of painting in North Italy, 1912, ed. T. Borenius, i, p. 98, n. 4. G. M. Rushforth, Carlo Crivelli,1900, p. 93. B. Geiger in ThiemeBecker, viii, 1913, p. 137. L. Testi, Storia della pittura veneziana, ii, 1915, pp. 686 f., 706. F. Drey, Carlo Crivelli, 1927, p. 158. B. Berenson, Italian pictures of the Renaissance,1932, p. 163. B. Berenson,Venetian Painters,1957, p. 71, fig. 162. R. van Marle, Italian Schools of painting, xviii, 1936, p. 84, n. 1. F. Zeri, 'Appunti nell'Ermitage e nel Museo Pusckin' in Bollettino d'Arte, No III, Jul-Sept. 1961, pp. 231, 234 ff., figs. 24-7. S. di Provvido, La pittura di Vittore Crivelli,1972, p. 75 ff., repr.